Paper Vote Canada 2 – Electronic and Internet voting are a danger to democracy. This blog is dedicated to preserving the existing Canadian paper-based, hand-counted voting system. That is to say, Internet voting doesn’t even have the benefits claimed for it, setting aside the fact that even if it did, it would be a terrible idea from a security and election transparency perspective. I don’t have the ability to go through every single one of the hundreds of 2018 Municipal Election reports from the hundreds of (mostly tiny) municipalities in Ontario that used Internet voting, many of them offering only Internet voting (no paper option at all). But I can give as an example Hanover, Ontario, with 5,411 eligible voters. Voter turnout was markedly lower among those aged 35 or younger than with those aged 55 or older. Turnout was highest among those aged 60 and over, consistently bettering 60% for both men and women. However, turnout was lowest among those under the age of 35. Due to technical issues in the closing hours of the election, the clerk declared an emergency under section 53 of the Act. Under the circumstances, the decision was made to extend the voting period by 24 hours with the polls officially closing at 8:00 pm on October 23, 2018. 49 municipalities, all clients of Dominion Voting Systems (DVS), were affected by the same technical problem and extended their voting period. 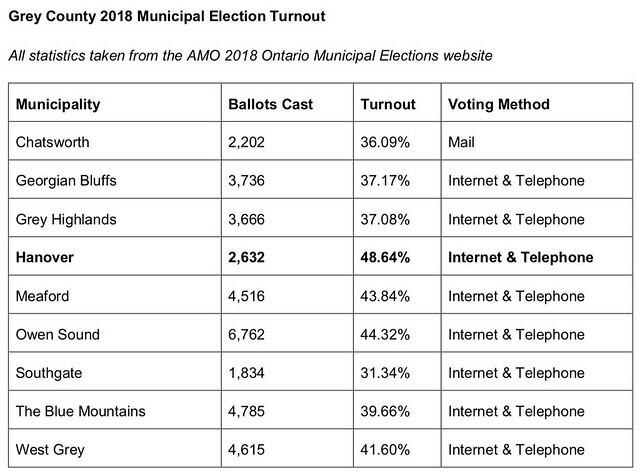 I find it remarkable that given that Internet voting delivers on none of its supposed turnout benefits, and fails in ways that paper elections can’t, Ontario municipalities still plan to use it for the next election. These results about turnout aren’t new – you can see many other examples in my blog post Online voting doesn’t increase turnout. I have also extracted Grey County 2018 Municipal Election Turnout, which gives a sense not only of the size of the municipalities involved, but also shows that none of them exceeded 50% turnout. In order to give an overall sense of the election, I include 2018 Municipal Elections Post-Election Summary by Municipal Service Office (MSO) – there are five regional MSOs. It shows a more complicated turnout picture, but basically the conclusion is that Internet voting doesn’t bring dramatic turnout improvements. 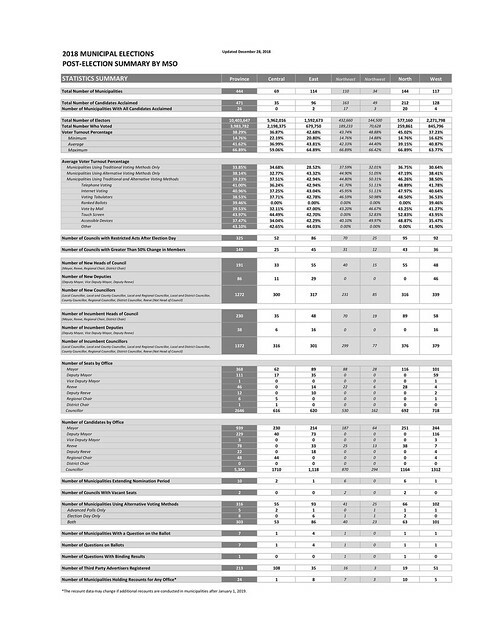 The US National Academies of Sciences, Engineering and Medicine (NASEM) uses a comprehensive study process http://www.nationalacademies.org/studyprocess/ to ensure high standards of scientific and technical quality. Chapter 5: Ensuring the Integrity of Elections contains many sections relevant to voting technology. Below are selected extracts only; please read the entire chapter for the full details. Malware can be introduced at any point in the electronic path of a vote—from the software behind the vote-casting interface to the software tabulating votes—to prevent a voter’s vote from being recorded as intended. With remote voting—voting outside of publicly monitored poll sites—it may not be difficult to compromise voter privacy. When voting, for example, by mail, fax, or via the Internet, individuals can be coerced or paid to vote for particular candidates outside the oversight of election administrators. Vulnerabilities arise because of the complexity of modern information technology (IT) systems and human fallibility in making judgments about what actions are safe or unsafe from a cybersecurity perspective. Moreover, cybersecurity is a never-ending challenge. It is unlikely that permanent protections against cyber threats will be developed in the near future given that cybersecurity threats evolve and that adversaries continually adopt new techniques to compromise systems or overcome defenses. Because there is no realistic mechanism to fully secure vote casting and tabulation computer systems from cyber threats, one must adopt methods that can assure the accuracy of the election outcome without relying on the hardware and software used to conduct the election. Uniform adoption of auditing best practices does not prevent tampering with the results collected and tabulated by computers. It can allow such tampering to be detected and often corrected. I would clarify that it can only allow such tampering to be detected if there are paper ballots to audit. Changing threat. Traditionally, the goal has been to secure against election fraud by corrupt candidates or their supporters who may attempt to favor a particular candidate by altering or destroying votes or tampering with the vote tally. The 2016 election vividly illustrated that hostile state actors can also pose a threat. These actors often possess more sophisticated capabilities and can apply greater resources to the conduct of such operations. Moreover, they may have other goals than shifting the outcome for a particular candidate. Specifically they may be seeking to undermine confidence in the election process and systems, which is a different kind of attack than changing an outcome. Any kind of visible or detectable interference such as defacing websites, Distributed Denial of Service (DDoS), or disclosure of information from within voting systems may achieve the goal of undermining confidence. Complicated and technology-dependent voting systems increase the risk of (and opportunity for) malicious manipulation. Internet Voting is covered on pages 101 to 106, including specific examination of Blockchains from pages 103 to 105. Below are selected extracts only; please read the entire section in the document for the full details. blockchain technology does little to solve the fundamental security issues of elections, and indeed, blockchains introduce additional security vulnerabilities. 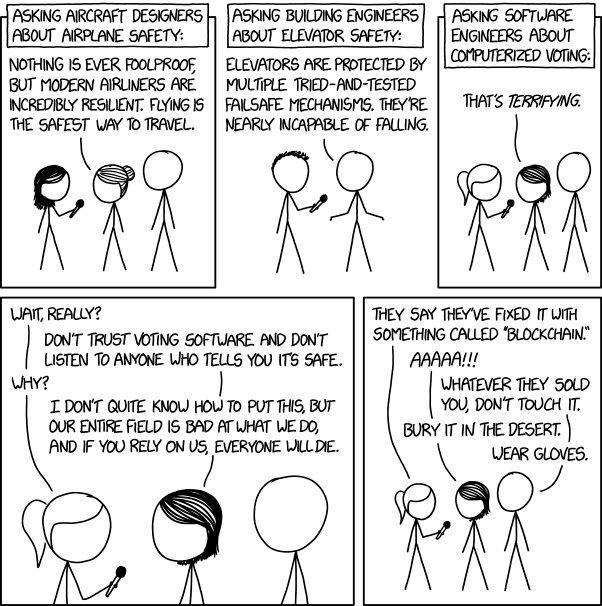 In particular, if malware on a voter’s device alters a vote before it ever reaches a blockchain, the immutability of the blockchain fails to provide the desired integrity, and the voter may never know of the alteration. The use of blockchains in an election scenario would do little to address the major security requirements of voting, such as voter verifiability. … In the particular case of Internet voting, blockchain methods do not redress the security issues associated with Internet voting. The report may be cited as e.g. Nothing remains of the May 2005 Securing the Vote report on the UK Electoral Commission site. There used to be a page Securing the vote – detailed proposals for electoral change announced but it is now gone. Note: The preceding is extracted from previous blog post Province of Ontario Internet voting.